ESPN to Televise Derek Jeter Night Celebration and Festivities on Baseball Tonight: Sunday Night Countdown from Yankee Stadium - ESPN Press Room U.S.
ESPN will provide extensive, on-site coverage leading up to Derek Jeter Night at Yankee Stadium this Sunday, May 14. The former star will be celebrated by the team and its fans as his iconic No. 2 jersey is retired and his Monument Park plaque is unveiled. The ceremony will be shown live on Baseball Tonight: Sunday Night Countdown with Karl Ravech, former Yankee Mark Teixeira and Tim Kurkjian. The trio will be on field with coverage starting at 6:30 p.m. ET. on ESPN. Ravech also sat down with Jeter in an exclusive interview. Segments from the conversation will run during the pre-game show and the full transcript will be available Sunday on ESPN.com. The New York Yankees will then host the Houston Astros at 7:30 p.m. on ESPN’s exclusive, full-national Sunday Night Baseball presented by Taco Bell. Dan Shulman will have the call with analysts Jessica Mendoza and Aaron Boone and reporter Buster Olney. After having his number retired, Jeter will join the ESPN team in the booth as a guest during the game. In addition, former Yankees manager and current MLB Chief Baseball Officer Joe Torre will also make a guest appearance to discuss his time leading the team during the Jeter era. SportsCenter contributor Sarina Morales will be on site at Yankee Stadium with coverage beginning Sunday morning. Anchor Zubin Mehenti will then host a SportsCenter Special at 3 p.m. on ESPN on Jeter’s career, including multiple guest contributions from Yankee Stadium and additional segments from the interview with Ravech. ESPN.com will have multiple pieces throughout the week highlighting Jeter’s career achievements and how his No. 2 jersey will live on in Major League Baseball. 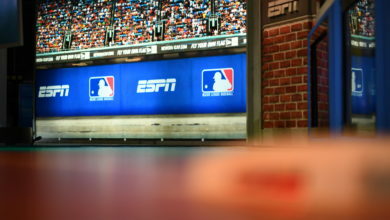 ESPN.com writer Andrew Marchand will speak with current MLB players who wear a No. 2 jersey in honor of Jeter, including Boston Red Sox Xander Bogaerts and Toronto Blue Jays Troy Tulowitzki. ESPN.com will showcase the 10 greatest moments of Jeter’s career. Before the number retirement ceremony, Marchand will discuss the only available single-digit jersey on the Yankees, No. 0. The piece will discuss if the team will ever assign the number or if anyone will ever choose the jersey. Michael Skarka at [email protected] or 860-766-1342 On Twitter: @Michael_ESPN.